I LOVE my kiddos; but they are so over building schema at this point. Glitter, lights, elves, poinsettia flowers, fanciful songs and all other things Christmas have invaded their teeny heads and they are OVER school. I KNOW you feel the same pain. Except for those of you who have 3 weeks off that start this week… LUCKY, lucky peeps… I am jealous of you. I suppose that means I’m OVER it all as well. Next week we are taking it EASY in class. 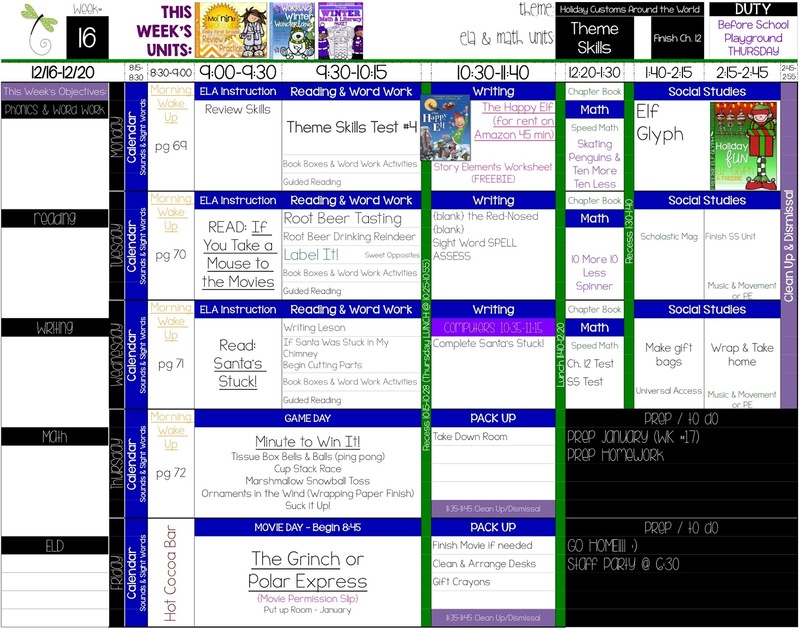 We are reviewing 10 more and less in math, taking unit assessments in ELA, I’m doing a bit of 1:1 reading assessments – but for the most part we are just having fun. 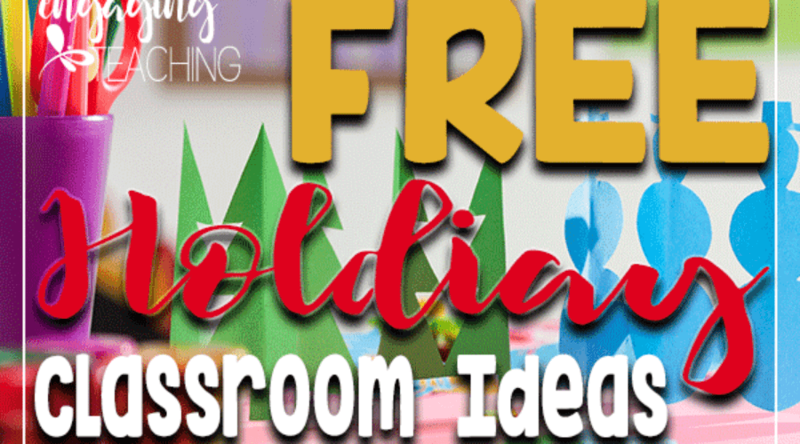 I have all kinds of Holiday Classroom Idea FREEBIES in this week’s plans for you. I am renting “The Happy Elf” from Amazon and watch it as a lead-in to the Elf Glyph in the afternoon. 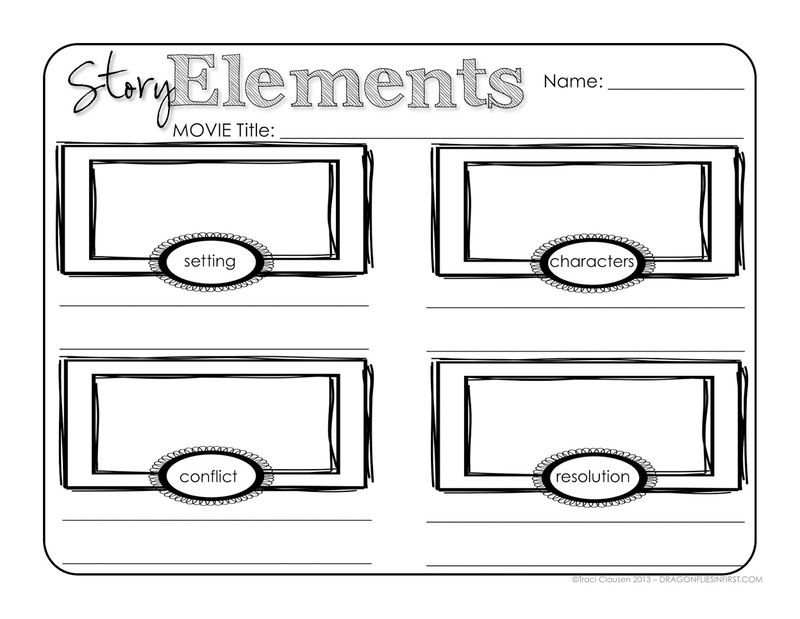 In an effort to keep it all “academic” I will have the kiddos complete a story element chart as they watch the movie. 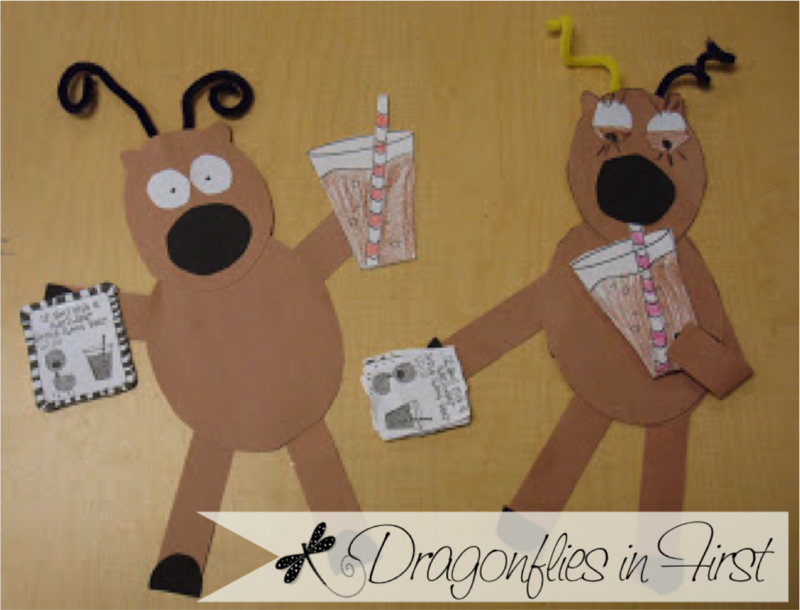 This Holiday Classroom Idea FREEBIE is included in my plans download this week. We’ll be doing my version of Santa’s Stuck. There are lots of versions of these all around the internet. I’ve included links to my Holiday Classroom Idea FREEBIE black lines for this project in my download for this week’s plans. Thursday is a minimum (early release) day for us. We will spend the morning playing “Minute to Win It” games. This game is also called “Junk in the Trunk”. 🙂 Place a few ping-pong balls and bells in an empty tissue box. Put slits into the bottom portion of the box so that you can slip a long piece of wide ribbon through it. Wrap this around your student’s waist with the tissue box in back (like a fanny pack). Students compete to wiggle, bounce and dance those balls and bells out of their tissue box until it is empty. Students toss marshmallows into buckets a few feet away. The one with the most “snowballs” collected in the bucket after a minute wins! Place several round ornaments on the ground. Students use decorates gift box covers (or wrapping paper covered cardboard) to “blow” the ornaments across the room (a few feet) and onto the finish line (colorful construction). The one with the most ornaments on the finish line at the end wins! Give students a large stack of large red plastic cups. They race to be the first to complete the largest, tallest castle using all of their cups. The students will need to figure out how to make the base large enough to allow them to add all of the cups vertically. Happily, Friday is another minimum day! Our first grade team decided to make it a “pajama day” for our firsties. Our plan was to show “The Grinch” but we needed permission from all of our parents to show it. We each had one student come back with “does NOT have permission” – SO we are showing “Polar Express” instead. I LOVE, LOVE, LOVE that make me bawl my eyes out book, but am not a fan of the movie. Oh well. I have included a copy of the permission letter in my plans download this week. Here are my plans for the week. You can enlarge them by clicking on the picture. Click HERE to download them and a bunch of FREEBIES- the plans hold clickable links to all kinds of stuff, too! Looks like a busy fun week my friend…5 more days!!! You are a super teacher. I understand the tiredness and still you share and care and….well thanks! Your week sounds absolutely perfect. I'm still in bed…about to face mine:)). Good luck to both of us!